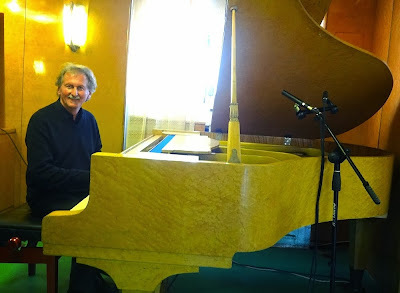 Gerhard Gruber is an Austrian composer and piano player. As accompanist for silent movies he is travelling around the world and has become the leading authority in Austria since 1988. He has performed for more than 550 different films (Boston, Mexico, Valencia, Kiew, Odessa, Kharkiv 2016, Pune 2015, Tokyo-Antwerp-Zagreb-Pisek-Luxembourg-Oslo 2014, Australia-New Zealand 2013, Los Angeles 2011/12, Washington 2011, Mumbai-Pune 2012, Delhi-Pune-Goa 2011, Tokyo 2006/ 2007/ 2008, Hobart/ Australia, Rotorua/ New Zealand 2008, Padova, Motovun Film Festival, Cineconcerts Bordeaux 2005, Filmfestival Pisek/ CZ 2008/ 2011, Filmfestival Uherske Hradiste/ CZ, Munich, Hamburg, Diagonale, Viennale 1999-2004). As a basic principle he appreciates improvisation for his work, which he regards as best way of a direct and always new dialogue between the events on the screen, the music and the audience. "Silent movie music in the sense Grubers is neither an exaggeration of the film, nor the “digestible making” of an “old-fashionable” artifact, neither a vanity nor another simplification of the existing work. It is always a partnership suggestion; in a partnership, which becomes never boring as it is guaranteed. An “open relationship” including intimate bond of trust."